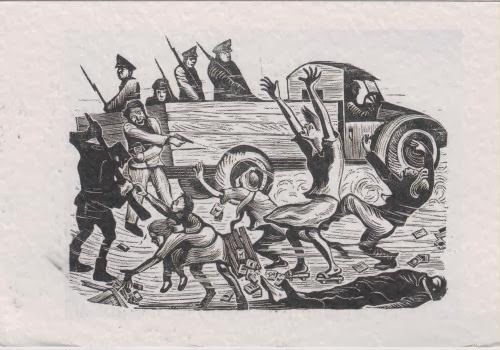 Postcard HK-126198 from Hongkong was entitled "the Horrifying Search - The 228 Massacre in Taiwan." Measured 14x18.3 cm, the illustration was first published by WenWeiPo, a newspaper in Shanghai, on April 28, 1947. The 228 Massacre was an anti-government uprising in Taiwan that began in 1947. After the Japanese rule of Taiwan for 50 years ended in 1945 due to Japan's loss in World War II, Republic of China government, led by the Chinese Nationalist Party or Kuomintang (KMT), took control of Taiwan. However, local inhabitants became resentful over the perception of corrupted KMT authorities that tended to seize private property arbitrarily and mismanage economy. A dispute between a cigarette vendor and an officer of the Office of Monopoly on February 27 triggered civil disorder in Taipei and an open rebellion spread to the whole island and lasted for days. The uprising was violently suppressed beginning on February 28, or 2/28, resulting in the massacre of more than 10,000 civilians. The incident marked the beginning of the KMT's White Terror period in Taiwan as the island was placed under martial law. Thousands more had vanished, died, or were imprisoned, before martial law was lifted on July 14, 1987. This incident is one of the most important events in Taiwan's modern history. It continues to divide Taiwan after 66 years.